Uppu Seedai and vella seedai are the most common snack made for Gokulashtami.It is the same dough made in sweet and salt versions. It is made with rice flour and jaggery. It is very crispy and little hard like a chikki but tastes awesome! !Vella seedai is always tricky and to be more honest it failed me many times Past two years it doesnt came out good .either the vella seedai will come too hard or when i put it in oil everything will dissolve in oil... but I never gave up. but This year it came out perfect and taste is very delicious. 1. Soak the rice and rinse it in water for about 30 mins and then spread the rice in a towel till it becomes dry..Now grind the rice in a mixer to a fine powder. 3. Add jaggery in a pan with 1/2 cup of water and when it dissolves, strain the jaggery water to avoid sand. 4. Again boil the jaggery water along with cocunut and sesame seeds and keep stirring it until the jaggery comes to one string consistency. 6. Now remove the jaggery from flame. Pour the jaggery into the rice flour and mix it well along with cardamom powder. 9. 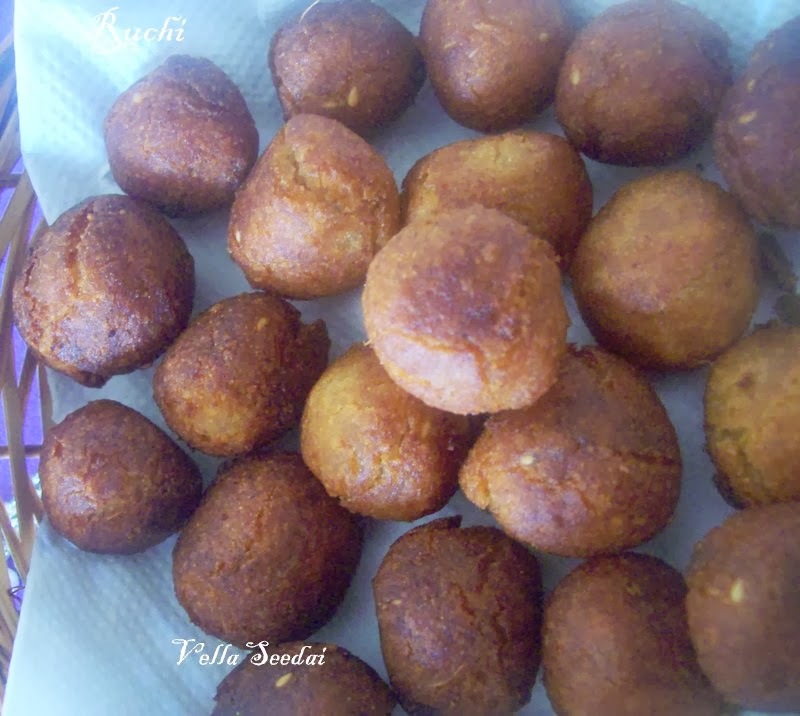 Make gooseberry size small balls of the vella seedai mixture and drop around 5-6 balls once the oil is hot. 10Deep fry the seedai till it becomes golden color. Repeat the process for the rest of vella seedai flour. Hello and welcome people. Hobby Chef recently completed its 2nd Anniversary. I like to thanks all the wonderful people out there who have supported me and also acted as critics at times. On our 2nd Anniversary I would like to invite all the creative people out there to contribute to my blog as guest bloggers. It is also an opportunity to earn some money from your love for food and cooking.